The club has a strong and dedicated road running section which competes regularly and very successfully, on a national as well as local level. 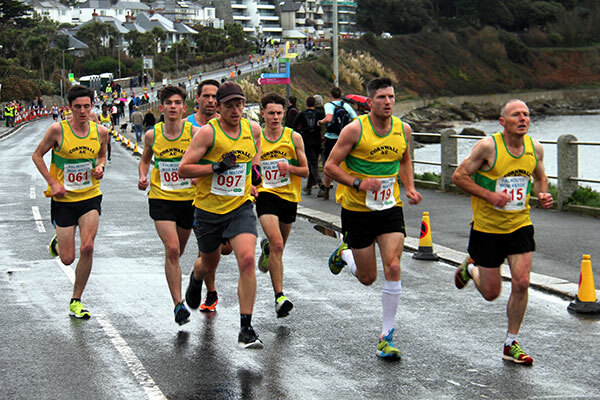 Locally, Cornwall AC competes against other running clubs in the county in the Cornish Road Running Grand Prix* - a series of 14 or 15 road races, of distances from 4 miles up to full marathon distance - and has won the Men's team title every year from 2002-2018 and the Ladies team title from 2008-2018. Individual men's champions over the years have included Daniel Simons (2003), Dave Buzza (2004), Tony Dunn (2005), Dave Buzza again (2007, 2008, 2009), Justin Thomas (2012, 2013, 2014) and Colin Snook (2015, 2016, 2018). Individual ladies’ champions have been Sharon Coyne (2003, 2004), Zelah Morrell (2006), Jo Friday (2007) and Emma Stepto (2008-2014 and again in 2016 and 2017), Donna Raggett (2015) and Heidi Tregenza (2018). Nationally, Cornwall AC individuals and teams regularly take part in mass participation road races and national championships around the UK- such as London Marathon and the Bath, Bristol and Cardiff Half Marathons – with many successful results. Members are often selected to represent the county in regional championships and challenges and some have competed internationally... please click here for our Hall of Fame. Over the years the Men's team have run the South of England and National 6 Stage Relays and the Ladies team the 4 and 6 Stage Relays. Both have finished in the top 20 in the country, as one of the top South-West teams. The club's youngsters compete in Area and National Road Relays as well as various shorter local road races, although most of their racing takes place on the country or the track. However, with the introduction of an Under 20's 'Mini Grand Prix' in 2008, Cornwall AC's Matthew Cleave claimed the inaugural male title and retained it in 2009, followed by Tom Slattery (2016) and Sam Goodchild (2018). Cornwall AC's Jenny Almey won the female Under 20 title in 2009, Bethany Alston in 2010, Elisha Hurst in 2012, Caitlin Mulroy in 2013 and Martha Carlisle in 2014. A clean sweep of the annual Cornwall Mob Match, an end of year 4 mile team based race held in Falmouth, has been achieved every year from 2002 to 2018 by CAC teams. The club also organises local road races, which have included the Duchy Marathon and Duchy 20, Christmas Turkey Trot and Hayle Flyer, as well as the current Summer Turkey Trot, which is part of the Cornish Grand Prix Series*. The Duchy Marathon was Cornwall's longest running race (the 37th in 2013) and Britain's second longest established marathon. The main training night for the road running section is Tuesdays at 7.00 pm at the Carn Brea Leisure Centre track, when a large, multi-ability, multi-club, mostly Senior group, often comprising up to 50 runners, enjoy a track session. This group is sub divided by ability into three smaller groups, which not only helps the organisation but gives all runners a better training experience. Please click here for our weekly training schedule. Smaller groups train on other days of the week, including Thursday evenings, meeting at the Carn Brea Leisure Centre reception for a road run of 6-7 miles. During the lighter summer evenings Cornwall AC runners either meet at Tehidy Woods, for a run across the cliff path, or in mid summer an organised Thursday night 'Summer Tour' consisting of 5-7 mile runs from different picturesque locations across Cornwall. We are always pleased to welcome new faces so if you are interested in joining, come along and talk to us, join in a session and find out more, or call Emma Stepto on 07717 377581 or Alan Rowling on 07765 881320. All abilities welcome at all sessions. We hope you will become part of our friendly and inspiring road running section! * Sponsored by Cornwall Glass and Glazing Ltd.